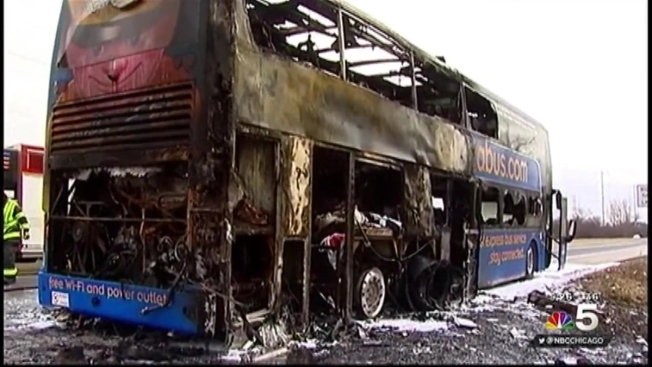 A Minneapolis-bound Megabus carrying about 40 passengers burst into flames in the northern suburbs of Chicago on Sunday afternoon, according to fire officials. Lake Forest Fire crews were called to the scene just after 12 p.m. when the bus caught fire in the southbound lane of Route 41 between Route 176 and the Lake Forest Hospital entrance, according to investigators. The first crews to arrive reported that the bus was fully engulfed in flames and that all passengers and the driver were off the bus. Lucas Peterson, travel columnist with the New York Times, said he was on board the Megabus, which turned around an hour after departure to "switch buses." Shortly after 1 p.m., he tweeted that the bus was on fire. Peterson said that after turning around, the driver pulled over to the side of Highway 41 near Lake Forest when a tire blew. Peterson said the driver told passengers not to panic and went outside just before smoke started "pouring out of the bus." He also said many pieces of luggage became "incinerated" after passengers abandoned their belongings to evacuate. Another video posted by a passerby on Twitter shows emergency crews working as smoke billows from the bus. "Megabus.com can confirm that one of our vehicles traveling from Chicago, IL heading towards Minneapolis, MN was involved in an incident today near Waukegan, IL," a spokesman for the company said in a statement, adding, "Safety is our top priority and Megabus.com is fully cooperating with the authorities with their investigation into the incident." No injuries were reported, and another bus was brought to transport the passengers, the Lake Forest Fire Department confirmed. Route 41 was shut down southbound at Gage Road from 12:30 p.m. to 1:45 p.m., officials said. Fire officials reported that there was extensive damage to the bus. The cause is still under investigation.